The SR165 16" Flat Arm Sling Chaise Lounge features armrests sculpted from flat aluminum, an adjustable headrest, safety bracing, and a vast array of custom options. 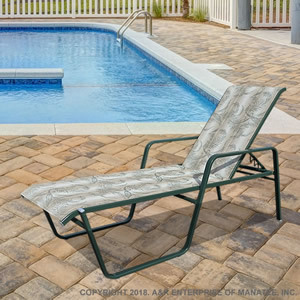 The SR165 16" Flat Arm Sling Chaise Lounge has a sandblasted and powder-coated aluminum frame with a double-stitched sling with the heaviest sling spline available. Like all of our commercial grade pool furniture, the SR165 16" Flat Arm Sling Chaise Lounge comes with a commercial warranty.